Until last Saturday (16 April 2016) I had seen opera at the cinema only a couple of times: Joseph Losey’s Don Giovanni at the Minema, Knightsbridge, and the Marx Brothers’ Night at the Opera. I have been to the Met in the pre-Gelb days and listen to the broadcasts in FM on Radio 3. But this was my first experience of the Met Live in HD. Peter Gelb has, since 2006, expanded the reach of these so that they are now available in around 2,000 venues in 70 countries. At Clapham Picture House we saw the Metropolitan Opera's production of Donizetti's Roberto Devereux with Sondra Radvanovsky, Elīna Garanča, Mariusz Kwiecien, Matthew Polenzani, the stage director was David McVicar and Maurizio Benini conducted the Metropolitan Opera Orchestra. This is a High-Definition video transmission, rather than a film, with 5.1 digital surround sound – I imagine a different audio feed from the radio set-up, and designed for a range of technical specs in the cinemas where the screenings take place. At Clapham Picture House sound levels were set very high, and somewhere along the line the audio signal was compressed, presumably with the assumption that our eyes would do the work our ears have to do in the real world or when listening to a radio. Before the show started the cameras were on the audience and orchestra. One member of the audience held up a placard saying “Hi, Ruth!” to the camera. What we saw was an audience of ordinary folk, not particularly dressed-up, and the older members of the orchestra, tuning and chatting before the show. This meant that viewers in 70 countries can see for themselves that this is not an esoteric, inaccessible art form (and in fact the opera itself portrays situations and emotions that we can relate to – albeit on a grand scale here). Our host for the evening (afternoon in New York) was soprano Deborah Voigt. She likened Donizetti’s opera to Verdi’s Il Trovatore, needing four of the best singers in the world to pull it off. The four main roles are certainly very demanding, with Sondra Radvanovsky completing the set of three Donizetti queens in one season (Mary Stuart, Anne Boleyn and now Elizabeth I). David McVicar’s production is stunning, simple and very clear. 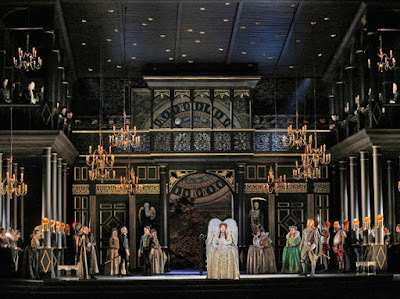 The single set, based on the Wanamaker Playhouse to give the idea of a play within the play, is a dark interior with corners and pillars from which the chorus observes all of the action, without really coming to the fore as they would in a big Verdi set-piece. The costumes, and the blue scarf that was the catalyst for the tragedy, were beautiful and incredibly detailed in the many close-ups These intimate scenes take place in view of an all-seeing, all-judging public. Yet the opera is very much about the private human predicament: a powerful woman is in love with someone who loves someone else. She has engineered the competition out of the picture (by sending the lover to Ireland and ordering the rival and the lover’s best friend to marry) but does not retain control over everyone’s emotions – including her own. This was intense and claustrophobic stuff, reinforced for us in the cinema by the dark set and limited camera angles. As for the music, Maurizio Benini played safe with the pit and stage – understandably when considering the stakes. The singers sounded well-matched but I am not sure if that would have been the case in the theatre. Radvanovsky’s voice is famously huge (I remember her in Stifellio with José Cura in 2007, pinning us to the back of the ROH auditorium) but we did get a heartbreaking pianissimo in here final aria (after she had shocked us by taking off her red wig and revealing her vulnerability) – and the close-ups showed an amazing control of her vocal forces with the elaborate coloratura throughout the range. Garanča’s lovely creamy, lyric mezzo, and possibly the other voices too – Kwiecien’s dark baritone and Polenzani’s rather one-dimensional though thrilling tenor – may have been manipulated to match. But that’s what technology can do (much to the annoyance of some dramatic sopranos). In fact the sound was a bit samey, apart from the aforementioned pianissimo and the orchestral interlude in Act 3. We got noises off from the audience at one point and the odd long-distance crackle. Still, it is an amazing feat to pull it all off, and to make opera available to such huge audiences as it is happening in New York. In the intermission, Deborah Voigt’s interviews with the singers made them all come across as down-to-earth, friendly, professional people. The whole thing provided a relevant and recognisable story and a meditation on the mismatch between power and love, with the additional smell of popcorn bringing it closer to home. The Metropolitan Opera's programme book for Roberto Devereux: download PDF. Roberto Devereux on BBC iPlayer.